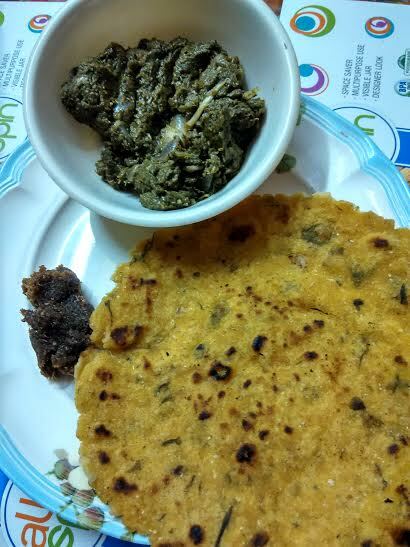 Sarson saag and makki roti is a quintessential Punjabi recipe. No Punjabi food mention is complete without this delectable blend of cornmeal and mustard leaves, spinach leaves, bathua leaves (Chenopodium album), and methi leaves (fenugreek). Of course, this is a labor of love, which requires a lot deal of time, from chopping the leaves to washing to patiently cooking the greens and letting them simmer on low heat for a good amount of time , but it's well worth the effort. You'll forget your efforts once you serve this delicious blend of vegetables to your family. I can say this because I am married to an Odiya boy. Since makki di roti and sarson da saag make a flavorful, lip-smacking, and healthy combination for Punjabis, I always wanted my hubby to enjoy it. He loves the combo as much as I, despite being from a state that uses stir frying method for greens. This is one pot of good health that you would want to have again and again. Anybody who has tried and tasted this heavenly combination knows it does not have a match. A personal favorite, makki di roti te sarson da saag is a must in every Punjabi home during the winter season. Let's get to the recipe shared by a dear friend Anna. Wash all the greens. Washing is a big task. Worry not. Take a big container or bucket for washing. Add 1/2 cup of water to a pressure cooker. Add tomato (whole or cut), chopped turnip, ginger, garlic, and green chilly. Cook for 7-8 whistles and lower the flame. Let it cook on low flame for 45-60 minutes. I cooked it at night and left it overnight in the cooker. Next day, I separated water from the saag and used it to knead makki atta. You may dry the water on a low flame with the lid open. To temper, take ghee, add ginger-garlic chopped and saute. Next add chopped onions and fry well. Now add the saag. Check salt. Add 2 tbsp of makki atta. Let it sit on low flame. Keep stirring in between. 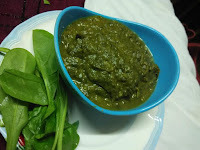 Try this sarson saag recipe and you'll instantly fall in low with it. Water as needed for kneading a semi-soft dough. Take small balls and roll out into rotis with hand. Sprinkle little wheat flour on the rolling board (chakli). Take one makki dough ball and press it gently. Rub with wheat flour and then roll out in a circular shape with hand. Just make sure you press with light pressure with your palm to roll out the dough. Place the rolled out chapati over it. Let the lower side cook for a while. Let it cook.Then grease the side with oil. Cook and then change the side and fry with oil. My plate includes makki roti, sarson saag and sweet & spicy ginger chutney. Check the recipe here. You may want to try another palak saag with broccoli and shalgam (turnip). The saag is bursting with flavors, healthy, and delectable.